Miley Cyrus (@mileycyrus) is one of the most popular people on Twitter. Twitterholic has her ranked #12 out of how many millions of people…? Man… I felt like running out and grabbing some Mc D’s myself! I got to thinking about this. 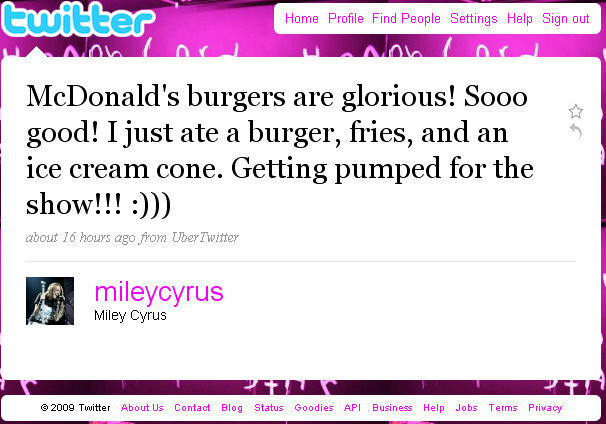 With Miley Cyrus having over 2.1 million followers on Twitter, McDonald’s needs to either a) be extremely thankful to Miley for a plug like that, or b) they need to be paying her for stuff like that!